Things were developing pretty quickly in 1915 and 1916. 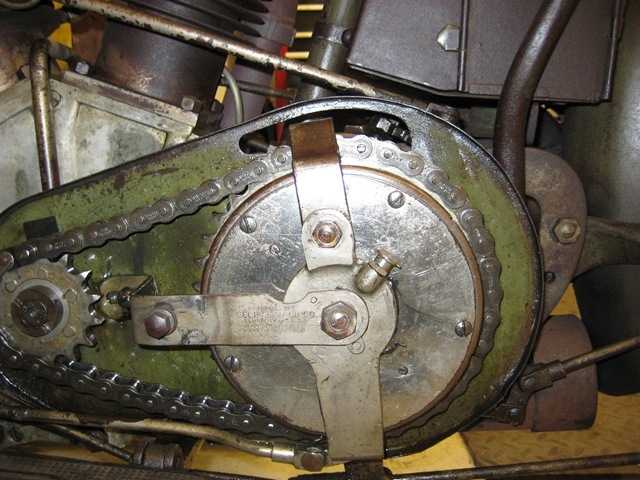 As the bike makers began to add 3 speed gearboxes and clutches to motorbicycles, there was no standard design. Each engineer and designer gave their best effort to provide what the buying public so dearly wanted. Between the 1914 models and the 1915 versions, many things were updated. Wheels and tires went from 28”x2” to 28”x3” (outside diameter stayed at 28”, but the sidewall height was increased, which meant a new size of rim and spokes). The 15 Excelsior was the first of the big bike makers to feature a streamlined tank and fenders (mudguards). 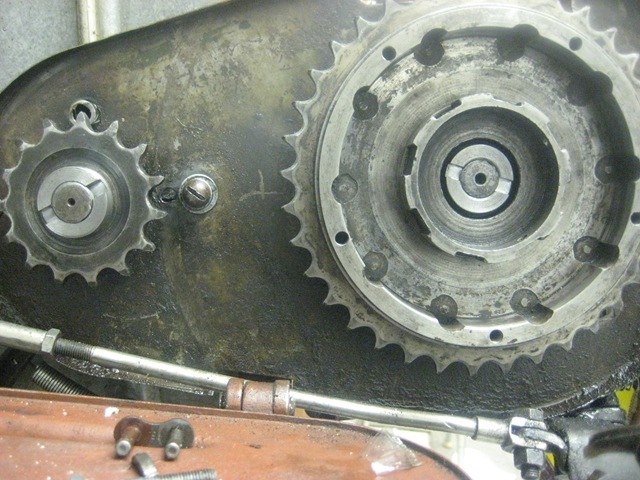 An even bigger change was the addition of countershaft gearboxes. Excelsior chose to use the Eclipse brand of clutch, with the proprietary X 3 speed gearbox. 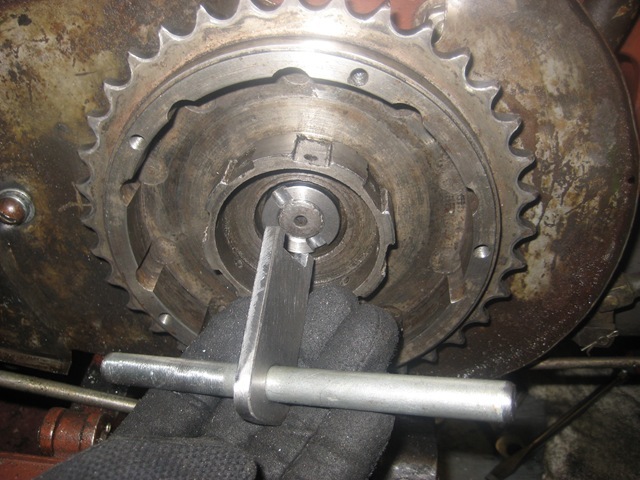 Which brings us to today’s article on how to make a special nut to hold an Eclipse clutch onto an Excelsior gearbox…. Excelsior used some interesting threads and fasteners when they designed their bikes during the 19teens. It isn’t entirely their fault, as the now-common thread sizes were not commonly adopted back then. For example 1/4”-24 was used by X, while others used 1/4”-20 or 1/4”-28. 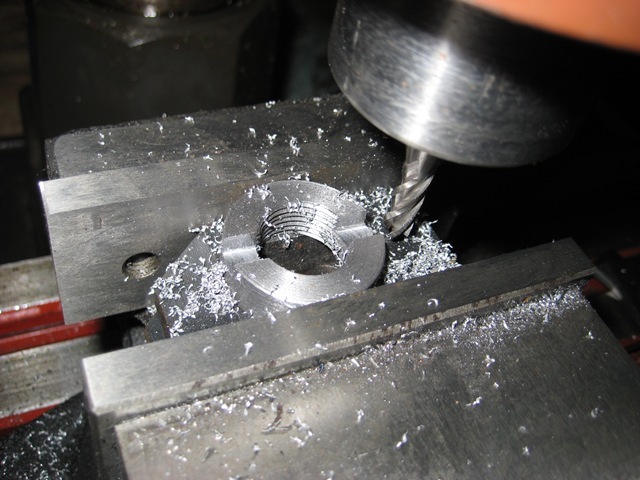 The nut that we will be playing with has a 3/4-18 thread — 3/4” in diameter, 18 teeth per inch. That sounds great, until you try to find one. 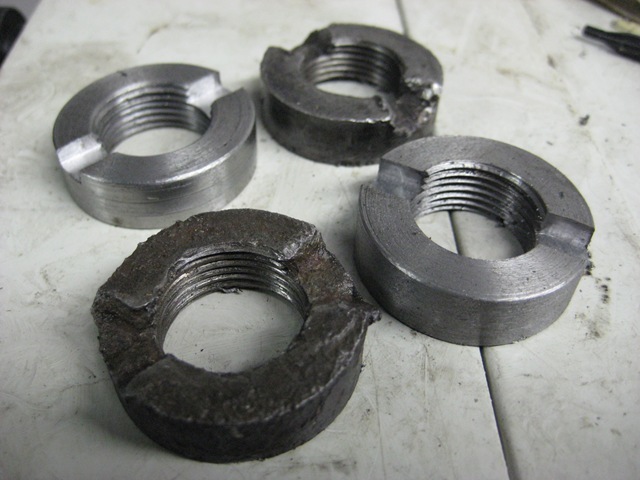 Today, nuts come in 3/4 coarse, 3/4 fine or 3/4 extra fine, which are 10, 16 and 20 threads per inch respectively. Please note that none of these happen to be 18 tpi. damn. 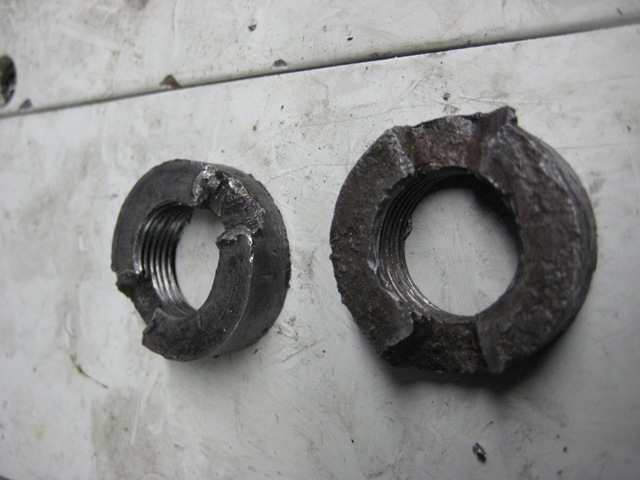 The second big issue with this nut is that the clutch hub is too small for a socket or a wrench to fit onto a hexagon nut. So X made the nut round. nice and round… The Damned Previous Owner (DPO) of my bike used a hammer and chisel to tighten and loosen the nut, which gives the nut such a nice patina. I know that some folks love a good patina. If they want ‘em, these two are for sale, cheap! 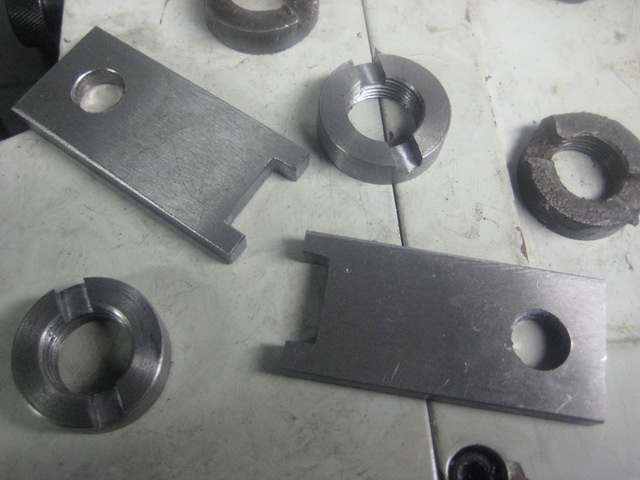 When the ID, OD and threads were cut, it was simple matter of cutting the part to length, facing it off, then dropping it into the vice jaws on the mill. These threads were cut with single point cutting of the threads, but tapping would be simpler to do. Custom taps are available, even 3/4-18 taps, from places like Rutland Airgas. 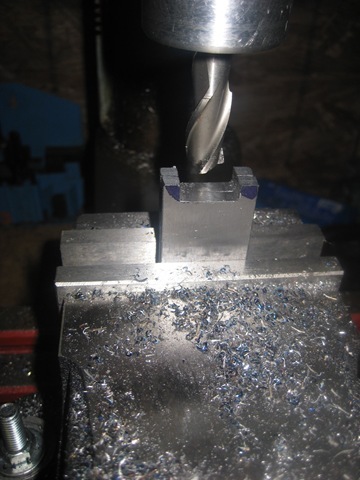 Once in the mill, it was just a few passes with a 1/4 endmill to get into the groove –as they said back in the disco era. 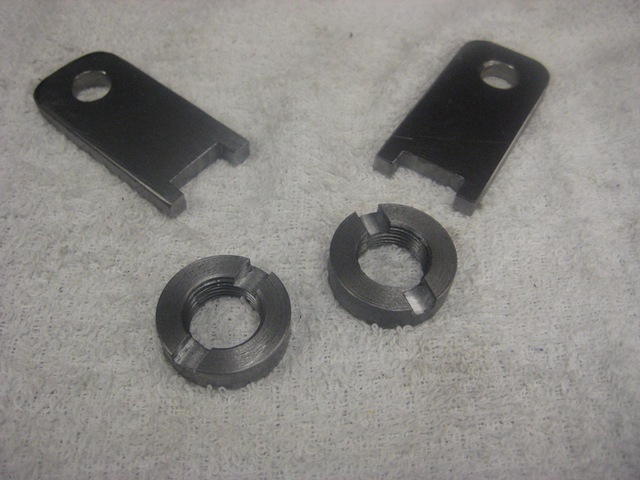 With the 1/4” slot cut into the part, it was complete and ready to fit onto the bike. (nickel plating will happen later, and I’ll have to do several articles on HOW TO: NICKEL PLATE). Here is a shot of old and new parts. But how to tighten such an odd little nut? My friend Mike G. came to the rescue, by loaning me his very low mileage 1917 Excelsior to measure and photograph. His bike is so complete and unmolested that it still has the factory tools in the toolbox! Here is a pic of the correct tool, with Mike’s correct nut installed. When scanning the X parts list two items come to our attention. 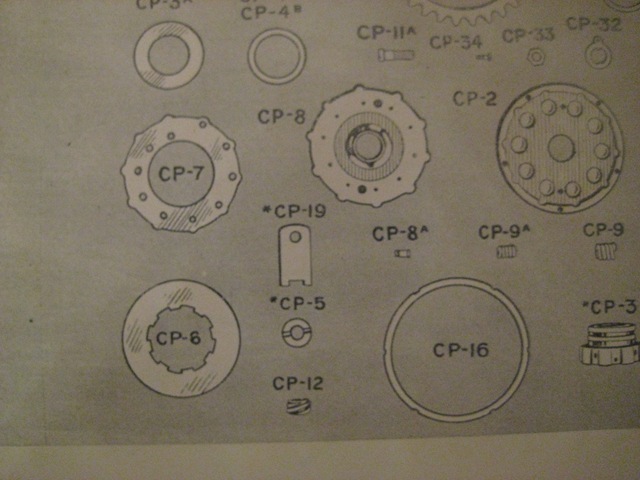 CP-19 is the tool and CP-5 is the nut. It is nice to see what they looked like new, although I was able to measure up Mike’s parts and my parts with enough accuracy to make replacement parts. Time to fit onto the bike. And a new nut for the engine mainshaft. 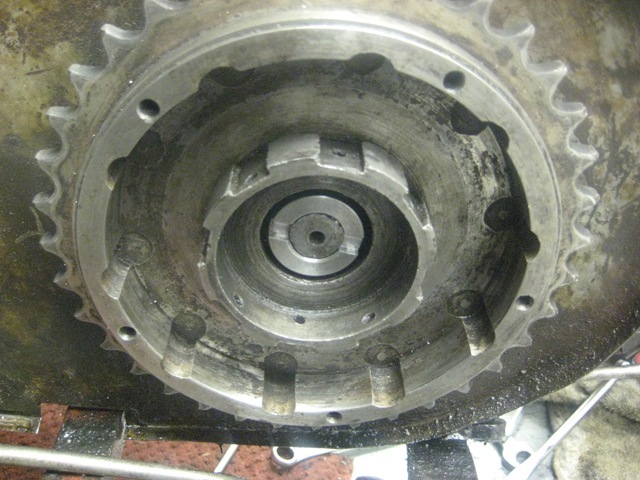 X conveniently decided to cut the same size threads on the gearbox mainshaft and on the crankshaft. That’s it. I made a few parts for myself, and a few for the ebay buyers. 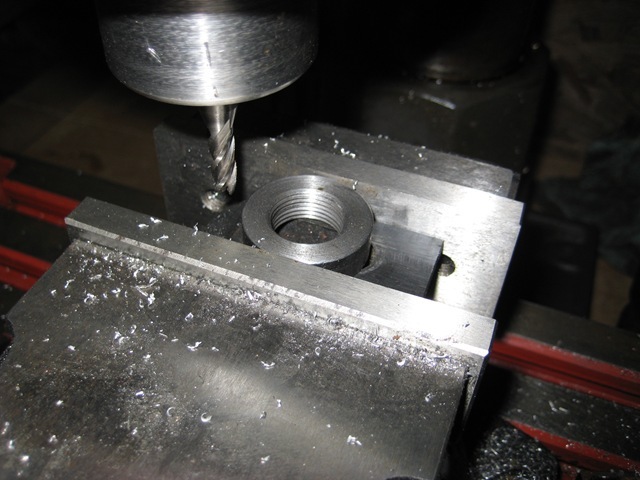 I’ll lose money on the total venture, once we calculate the cost to buy the tooling, the raw material, and if I value my time at say, $5 per hour. 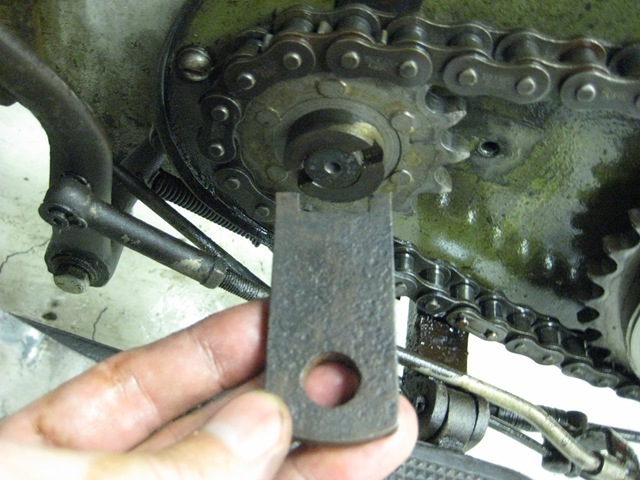 Don’t fool yourself into thinking that restoring bikes or making parts will result in a net monetary gain. I lose $ on just about everything that I do. But what is the value of knowing that it was done right? This bike will soon be 100 years old. I hope that somebody is riding it when it celebrates 200 years. Enjoy your time in the shop. Hi Paul. The kicker gear and gear segment on my bike don’t mesh well either. But they are loose, not tight. I’ve thought about making an eccentric bushing for the kicker shaft, then rotating it in the gearbox until the gears mesh better. But there isn’t much meat there to work with. Maybe after the Cannonball, I’ll play with it again. Stay in touch, it would be good to see you when you are back.